The 2017 Most Outstanding Finance Student Organization in South Luzon, Southern Luzon State University – Junior Financial Executives (SLSU JFINEX) in Lucban, Quezon will be celebrating its 9th foundation anniversary. The event will be held on February 9, 2018 at SLSU Covered Court. The theme of Finance Fest 2018 is “Go Beyond Boundaries. Create Tomorrow’s Possibilities”. This one-day event aims to encourage its 450 member-students to refresh their bodies and minds with wide array of unique and inspiring activities. The Keynote Speaker for the Opening Ceremonies will be Mr. Alberto C. Manduriao, the Regional Vice President of PhilHealth Region IV-A. Afterwards, there will be simultaneous activities like Sagip Buhay: Phoenix Blood Donation Drive in cooperation with Philippine Red Cross – Quezon Province Chapter. This activity aims to build awareness among our members of the need for regular blood donation in order to maintain an adequate supply of blood for patients requiring transfusion. Also, the Sining Galing: Phoenix Creativity Showcase include different categories such as poster making, essay writing, pagsulat ng sanaysay and malayang talumpati that aim to boost the creativity of our members. 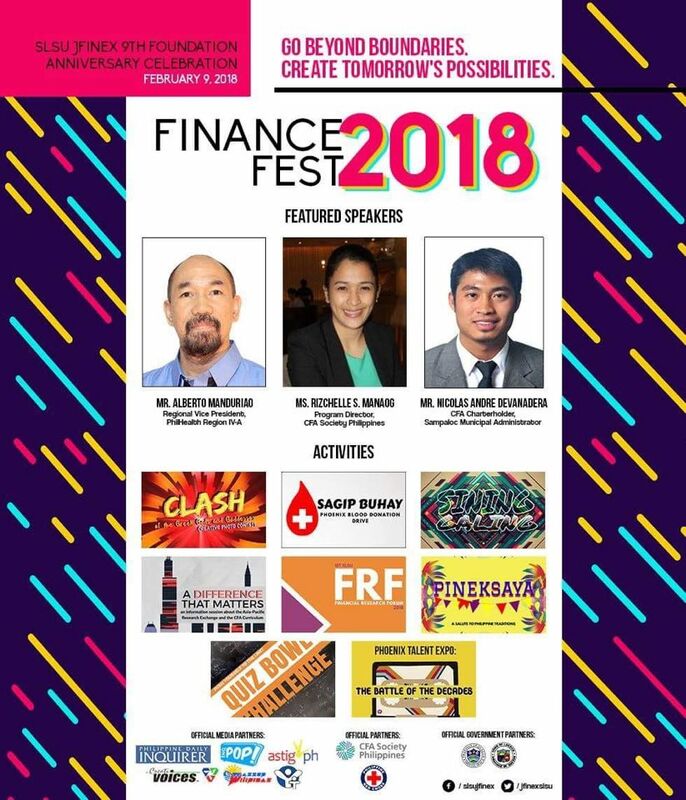 This event will also serve as the venue for the 1st SLSU Financial Research Forum - an event in which the organization celebrates the wealth of research carried out by the dedicated students of BSBA-Financial Management. The panel of the forum includes Prof. Hermina Babia, CBA Faculty and Mr. Nicolas Andre Devanadera, a CFA Charterholder and current Municipal Administrator of Sariaya, Quezon. An information session about the Chartered Financial Analyst (CFA) Curriculum as well as the Asia Pacific Research Exchange will be leaded by Ms. Rizchelle Manaog, the Program Director of CFA Society Philippines. This event would not be possible without our Official Media Partners – Astig.PH, Creativoices Productions, Voice of the Youth Online, InqPop, Philippine Daily Inquirer and Wazzup Pilipinas. A big thanks to our official Telecommunications Partner Smart, as well as the Municipal Government of Lucban, Quezon, the Office of Vice Governor Sam Nantes, the Office of Governor Jayjay Suarez. SLSU JFINEX is a proud member of the Junior Confederation of Finance Associations – Philippines and a proud student organization affiliate of the CFA Society Philippines.